One thing I adore about my growing sewing skill set is being able to whip up items I surely would have purchased before. It used to be a pretty regular practice of mine to buy the kids a set of fast fashion seasonal pajamas at least a few times a year. Now, I can select my favorite fabric (or let the kids choose) and sew sets whenever I like. Halloween is the favorite holiday in my household so I couldn’t resist sewing a couple sets of pajamas for this year. These are sewn from the same pattern I shared last year. I thought I would share some tips related to batch sewing and why I find it especially useful. When I refer to batch sewing, I am talking about making two or more of the same pattern at once. Time savings – The most obvious benefit of batch sewing is that it is efficient. 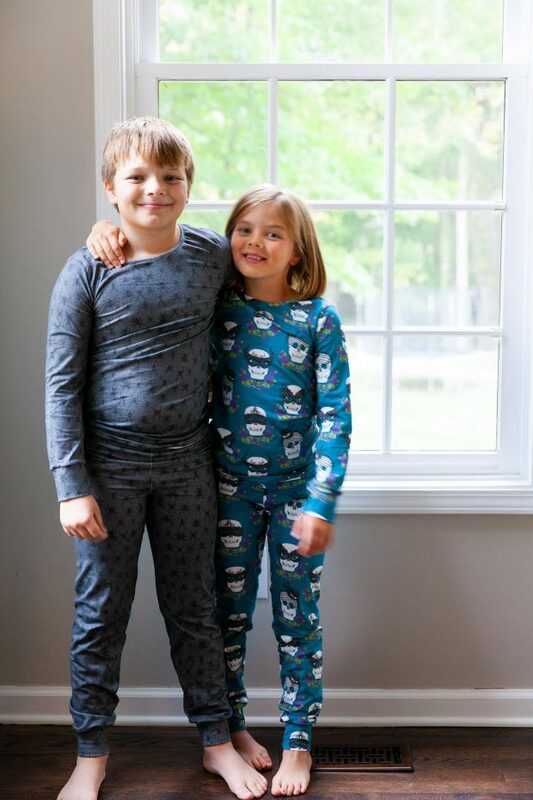 Rather than make one set of pajamas all on its own and then start again on a second or third, the whole process is streamlined when completing multiple sets in tandem. You might as well make two (or more) – When my kids’ wardrobes used to be 100% purchased, I would often buy the same garment in multiple colors or patterns. With sewing for kids in particular, it just makes sense to go ahead and make two or three of an item that you know is going to be worn a lot. Practice makes perfect – I referenced this a bit in my Learning to Sew post, but I think one of the best ways to improve your sewing skills is to make the same pattern multiple times. With each time, you will see small improvements which lead to big progress over time. My finishing details and efficiency overall on this project as compared to even a year ago are so much better, and repetition is part of the reason why. Cut fabric with caution – Thought and care are an essential part of fabric cutting with each and every project, but even more so when batching projects. Particularly if you are making multiple sizes of the same garment, be absolutely sure you are making the correct size using the correct fabric. I would suggest just putting the fabric and pattern pieces for the other size in a separate room to avoid cutting the wrong size in the wrong fabric. I might be speaking from experience here. Choose fabrics that work with coordinating thread – The efficiency advantage of batch sewing partly hinges on being able to whip not one but two or more pairs of pants or whatever through your sewing machine. If you have to switch back and forth between thread colors with every move you make, this advantage is lost. Consider this when selecting fabrics for you batch sewing endeavors. 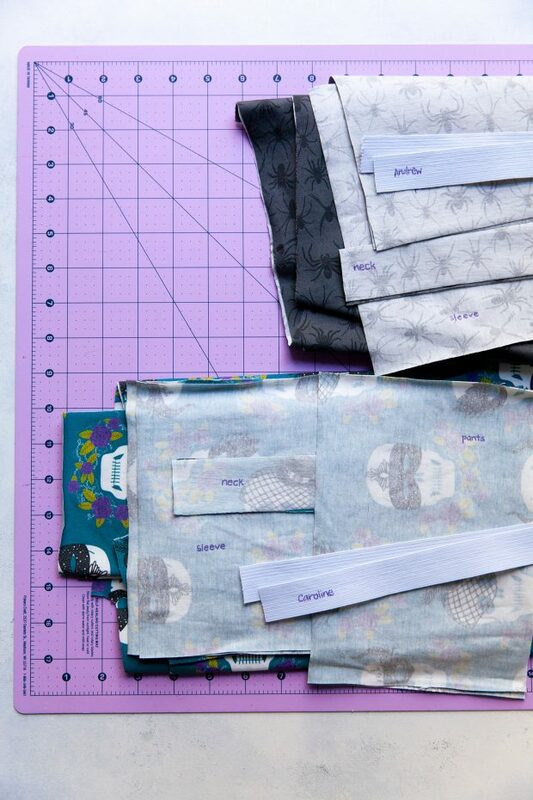 If you sew, do you ever batch your projects? I’d love to hear your thoughts and experiences. Scroll down below for links to the pattern and fabrics included in this post, as well as a photo gallery. Spider Crawl Organic Jersey Knit in charcoal from Hawthorne Supply Co.
Masquerade Organic Jersey Knit in topaz from Hawthorne Supply Co.